etchall® resist gel is a water-based gel that enables you to create your own unique designs without using a stencil. etchall® resist gel forms a protective barrier against etchall® etching creme. This barrier acts as a resist preventing the surface from being etched. 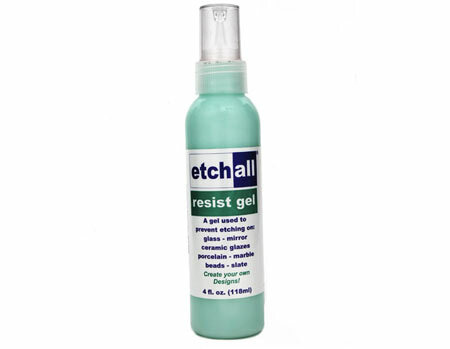 etchall® resist gel can be either squeezed directly from the bottle or brushed evenly onto glass. etchall® resist gel appears green and opaque when wet, but dries clear. Drying time depends on thickness of application.